There are all sorts of items on your car you can adjust, and as you’ve probably noticed, some have more profound effects than others. One area that often gets overlooked is the Ackermann effect. Acker who? At first glance this seems pretty obvious: you turn the wheel on the transmitter and the front wheels respond. If it were that simple, we’d be skipping this article and you’d be back to building shocks, rebuilding your diff, or some other wrenching needed in your car. This oversimplification of steering hides the fact that there is a lot of engineering and geometry that goes into this seemingly basic item. In the simplest form of steering (think about those old red wagons most of us had when we were kids), both the front wheels point in the same direction. You turn the wheel and the tires turn around the corner parallel to each other. The problem is when this happens, a lot of scrubbing takes place, lessening the effectiveness of the tires to make a smooth arch. When a car attempts to make a turn, the outside wheel travels further than the inside one. Ackermann controls the difference in steering arcs between the front inside and outside wheel. The goal in tuning Ackermann is to get the car to keep a consistent steering arc after going from off-power to on-power, while trying to keep tire-scrubbing to a minimum. Here is where the problem lies. Unfortunately, every track has a variety of turns that usually consist of big and small radii and once the Ackermann position is set in the car, you are stuck with its angles. 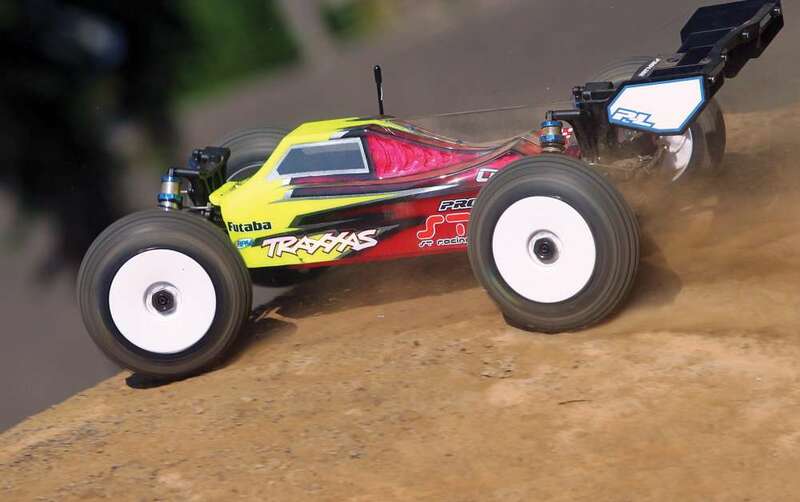 So it is important to find the right balance for the track’s layout where your chosen Ackermann setting will result in the smoothest, easiest and fastest line to drive. How we do that is something that isn’t as hard as it sounds. Ackermann is used rather commonly in car design but many take it for granted and have no idea what it means or where it came from. The fact is that it isn’t just a word, but a name. Ackermann was actually a person who helped develop this technology way back when horse-drawn carriages ruled. It goes even further back than that and was first introduced in 1758 by Erasmus Darwin. If that name sounds familiar, it should because he shares the name with Charles Darwin, who was his son. As you know, Charles Darwin is the guy who caused a bit of a stir about monkeys, humans and evolution. Erasmus Darwin first wrote about this steering system in 1758. His paper, “Erasmus Darwin’s improved design for steering carriages and cars”, would spearhead a new way of thinking. However, it was never patented until 1817, when Rudolph Ackermann patented it in London, and now we are stuck with a name that sounds funny and isn’t truly giving credit where credit is due. So before you go on and argue some points about creationism, let’s get back on topic. “True” Ackermann minimizes scrub by positioning both tires perpendicular to the turn center. This is defined by angling the steering arms so that a line drawn between the kingpin and steering arm pivot points intersect with the center of the rear axle. This gives true Ackermann steering geometry and this means there is no toe angle change on the inside wheel in regard to the inside radius of the circumference of the turning circle. More Ackermann angle can be added by adjusting the angle of the pivot points on the steering arms so that the point of the intersection is forward of the rear axle’s center. This steering geometry achieves greater angular inequality of the turned wheels, resulting in the inside wheel trying to follow a smaller diameter circle. In medium-to-low grip conditions, more Ackermann is suggested. 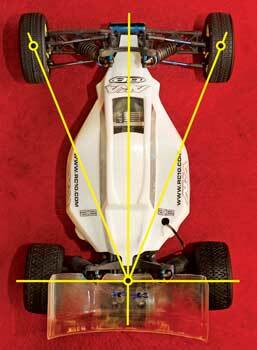 Less Ackermann angle can be achieved by having the angle of the pivot points on the steering arms so that the point of intersection is behind the center of the rear axle. This geometry achieves a reduced amount of angular inequality between the turned wheels resulting in the inner wheel trying to follow a larger diameter circle. Less Ackermann is desired in medium-to-high grip conditions. Now that you have an idea of what more, less or “True” Ackermann angles do, it’s time to put that knowledge to good use. 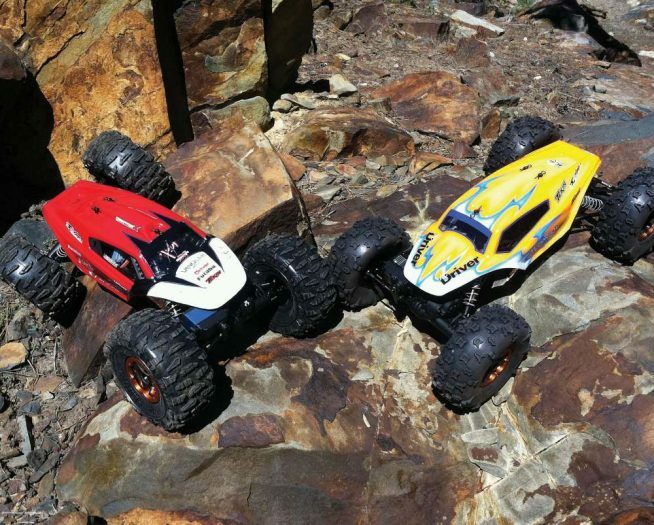 On most of our RC vehicles, changes are made by altering the angle of the steering links. This is fairly easy and can be done a couple of ways; by changing the inner location of the steering links at the inner mount locations or by changing the location at the outer position which is usually at the steering blocks. Most vehicles have multiple options that let you select the desired position in fine increments. Changing the inner position usually has the greater affect. By moving the inner position forward and creating the most angle with the steering links, less Ackermann effect is generated. The opposite holds true for moving the inner link further back. 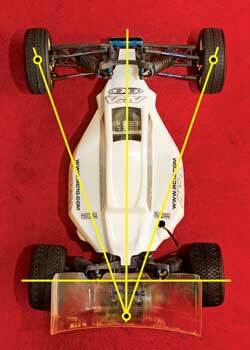 This is usually the way to make changes on 1/8-scale buggies and other off-road vehicles. Changing positions on the steering blocks is used to fine-tune your Ackermann effect. By moving the link-mounting position forward, it creates more Ackermann effect and makes it more aggressive for tighter turns. You’ve learned what the needs are for your tire angles, but there is more to it than that, especially since every corner can be different. 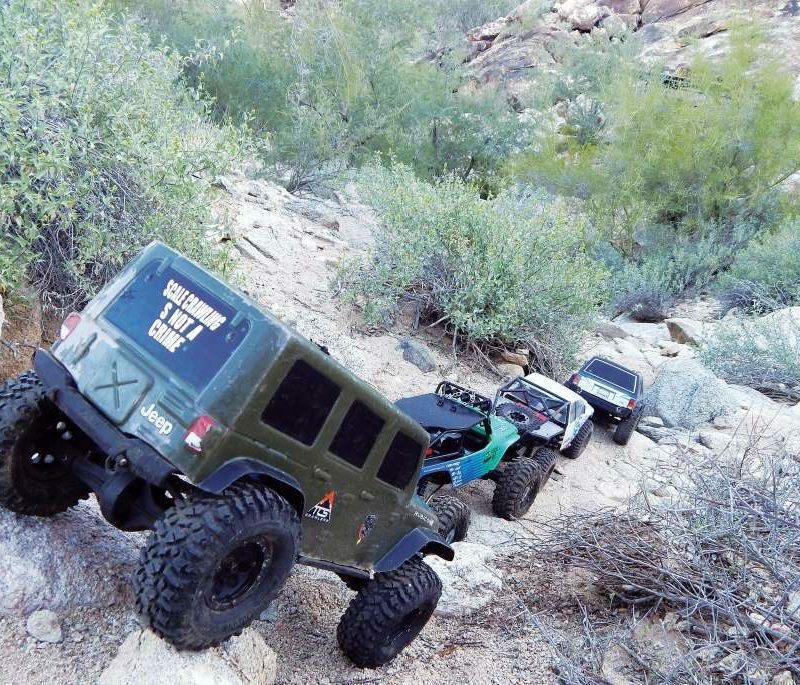 As you navigate a corner, your steering input will be less or more, depending on the speed and radius of the turn. Having angled steering arms changes unequal angular movement exponentially. In other words, the more you turn the wheel, the greater the angular difference between the wheels. This is a big deal since without the same angle difference between them, the tires would remain the same no matter how much each tire was turned. 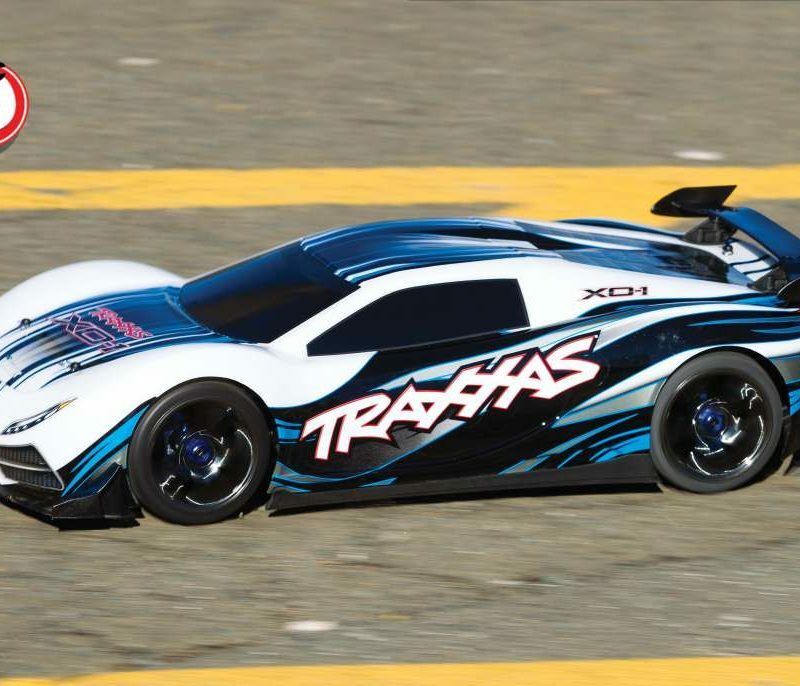 For tight, low speed turns, a bigger difference in angle is needed. Of course, the opposite is true for bigger and faster turns. At the same time, both would need to go back to zero angular difference when pointed straight. This couldn’t be accomplished using parallel steering arms, which is why all of our cars have angled ones. Now that you’ve learned about Ackermann and realized that the name goes beyond some old guy, it’s time to apply this newly-learned tuning option. Adjusting this is usually considered something reserved for experienced drivers or engineers, but with a bit of this information you will have one more weapon in your arsenal, but keep in mind, like many things, it isn’t isolated. 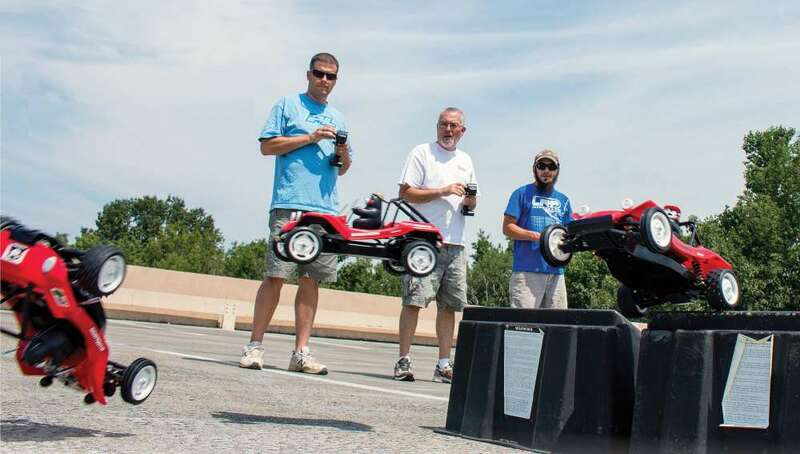 There are a lot of other things that can affect Ackermann on your car such as bump-steer, toe, camber, caster, kick-up, roll-center, etc., so take your time and experiment and record your results. When applied just right, you’ll be amazed at what that magical balance does for your car.